상수도 보급현황은 상수도 보급율과 급수량으로 측정될 수 있다. 상수도 보급율은 1980년대 93% 내외에서 1990년대 이후에는 100%의 보급율을 보이고 있다. 1인당 상수도 급수량도 1980년대 이래 급격히 증가하여 90년대 후반 약 450ℓ/일까지 증가하였다가, IMF 이후 절수운동 등으로 2000년 현재 약 400ℓ/일의 급수량을 보이고 있다. 정수장은 수도물을 처리하는 곳으로 서울에는 9개의 정수장에서 물이 처리되고 있으며, 처리된 물의 공급은 에너지를 효율적으로 사용하기 위한 자연유하식 공급체계로 정수장별 급수구역 형태는 일정하지 않다. 서울시의 물 공급방식은 정수장에서 직접 급수하는 방식에서 정수장에서 처리된 물을 배수지에 모아두었다가 급수하는 배수지 급수체계로 전환하려고 하고 있으며, 현재 23개의 대형 배수지가 있다. The status of water supply can be measured by the distribution of water supply facilities and the amount of water supplied. By the 1980s, the distribution of water supply facilities stood at 93% but in the 1990s, 100% of households had access to a water supply. The amount of water supplied per person also increased sharply since the 1980s to about 450ℓ/day in the late 1990s. Thanks to a 'water saving campaign' after them IMF monetary crisis, the amount of water supplies decreased to about 400ℓ/day in 2000. Seoul has 9 water purification plants, and the purified water is supplied to each household in the most energy effective method, natural flow, and each purification plants supplies water to different regions. Seoul is changing its water supply method from a purification plant-tohousehold system to a filtration plant-reservoireach household system. 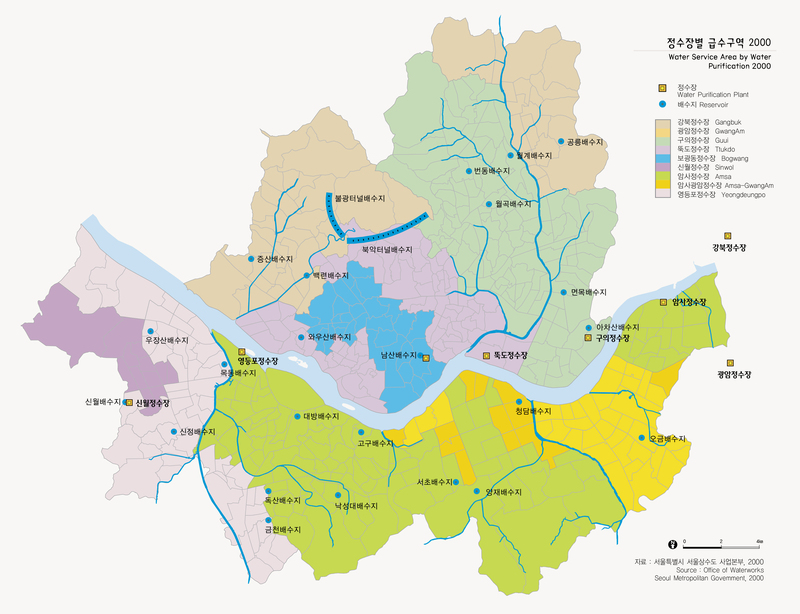 Presently, Seoul city has 23 large water supply reservoirs.